Phil Chadwick's Art: #0124 "Summer Recess Near Rosemont"
#0124 "Summer Recess Near Rosemont"
This was a summer afternoon at an old school on Highway Number 89 just to the west of Rosemont, Ontario. 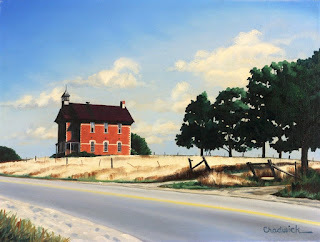 We were on our way to Meaford late in the summer of 1983...long before we moved to Schomberg. This school was on a windy high point of land and commanded a view for many miles in all directions. Generations of farm kids would have walked uphill to this school. The trip home had to be down hill. It would have been an exaggeration to claim the the journey to and from school was all uphill. Highway 89 would have been a dirt road in those times but in 1983 it was a busy paved highway. I would have painted this in the back corner gallery of the basement which also served at the guest room. The north light was filtered by the back deck that overhung the poured cement walk out area. The light for painting was very good.